Artists from around the country touch by the 1.8.11 Tucson tragedy have used their creative skills to help raise money for the victims. 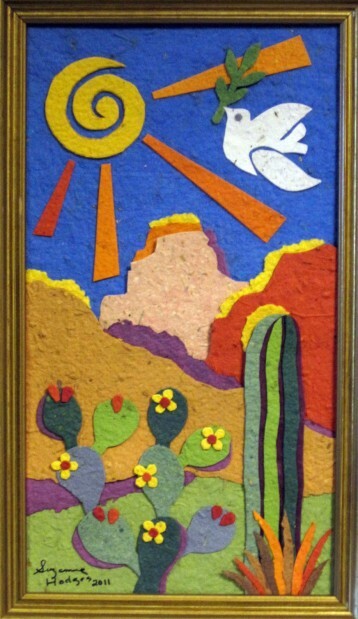 A call for visual artists to create a work went out from Bohemia: An Arts Emporium, in Tucson, Suzanne Hodges created “Simple Gifts.” Her work was one of over 100 pieces created by 60 artists that were auctioned off at an event coördinated by Tana Kelch, owner of Bohemia, which raised about $4,000. Many musicians used the Internet to offer tributes to the victims. Thanks to the established fan bases of Sam Tsui, and Ahmir, a cover of John Lennon’s “Imagine” has been viewed by millions of people around the globe. The last image in the video is a handmade poster that says, “Violence solves nothing.” To read more, click here.